One of the key aspects to succeed when trading, amongst other things, is having the right tools to help you make good decisions. 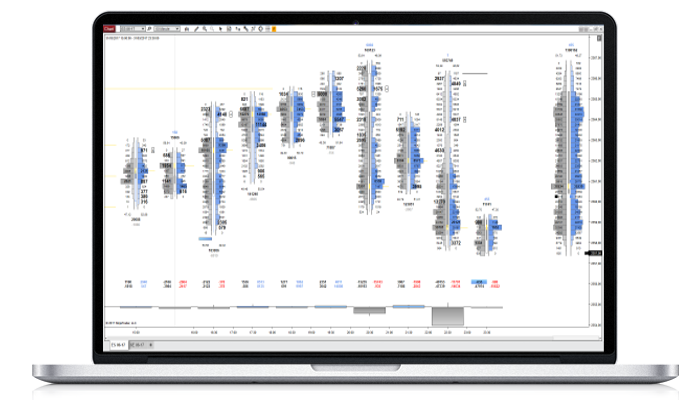 Through the VolumeLadderCharts, you can get information of great value to manage your trades in markets constantly changing and evolving, seeing in real time how buyers and sellers interact amongst themselves. It's important to see clearly what information you are analyzing. Therefore, the developing interface is designed so you can visually have a clear understanding of the situation. 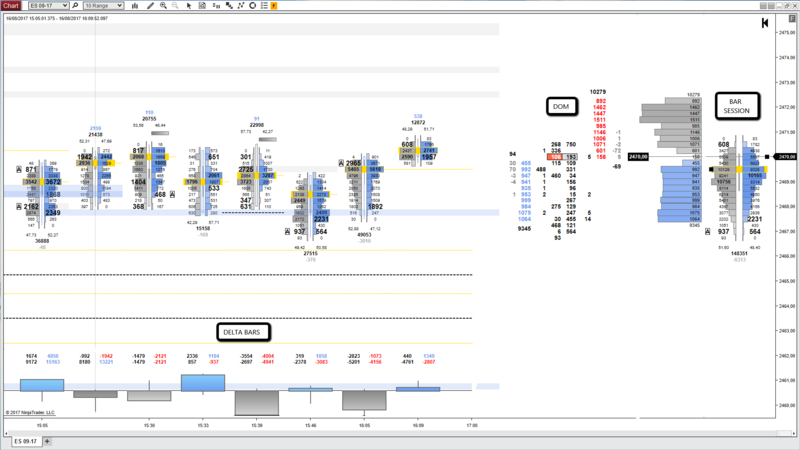 Thank's to the new features of NinjaTrader 8 you can enjoy historical information about buying and selling activity. This makes easy to take decisions based on past information. All Markets are different. 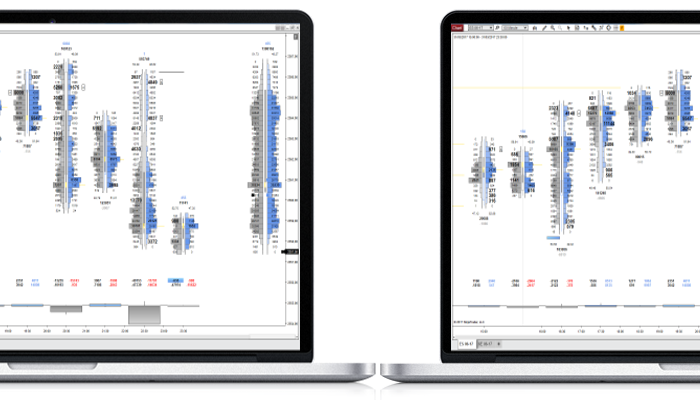 Through the volume ladder chart indicator parameters, you can adapt the information to the market you want to trade, and see the information as you want. Take a look at the different visualizations that you will see with the VLC, with full control of how you wish to see them. Configure the color of the volume, bid, ask, delta histogram, border histogram, font size, type of font…... For the colors, we use a volume gradient, easy to see visually fast changes in volume. Also, you can use shortcut keys to change quickly through these views. You will be able to filter a ladder at each tick by the volume quantity. 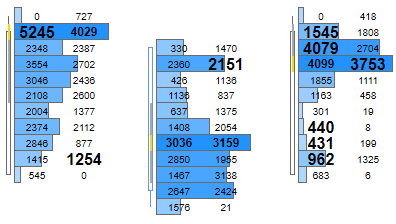 When it comes to VA, POC, UA the indicator has many options to show them, configure to your liking, or extend these zones if they are naked based on a specific volume. Imbalances are another advanced feature. You have several options to configure them in the way you need, diagonal, horizontal or both. 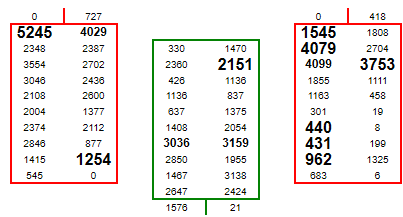 If you need to extend zones based on imbalances, you have a way to do it. Take a look at the absorption feature. 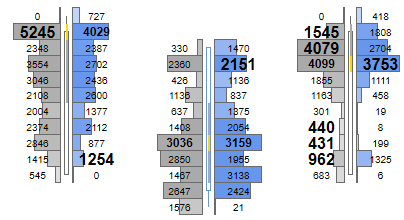 Easy to spot trapped traders and excellent areas to go with the participant that is absorbing to the opposite side. The extreme ratio feature will help you to know if an extreme is rejected or defended. 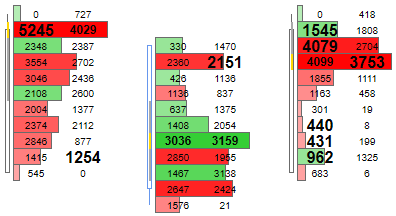 See clearly if buyers or sellers are winning the battle. 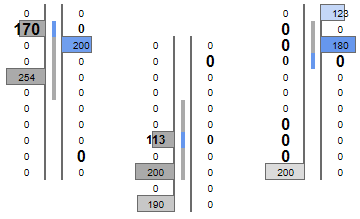 With the Delta Bars, you will be able to see the delta of the bar, the cumulative delta by session, the delta of imbalance prices and the cumulative delta imbalance. 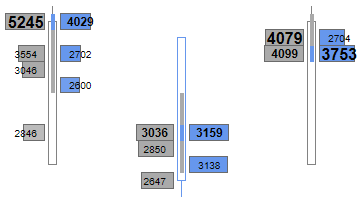 With the Delta Reversal, you can configure the Delta Bars, to spot changes in the predominant side. You will get a nice summary of the session. 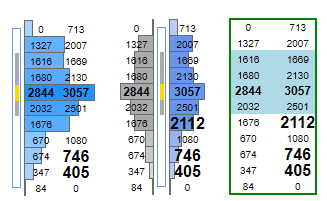 You will know where is the Initial Balance, the Value Area for the session, VPOC, absorption and imbalances prices. 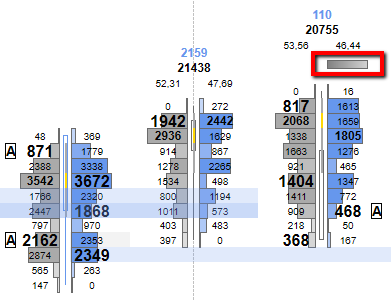 Total volume, percent of buyers and sellers, and Finish Delta will give you more details about the predominant side for the session. A complete summary to get a clue about what participants are doing and to help you make decisions. 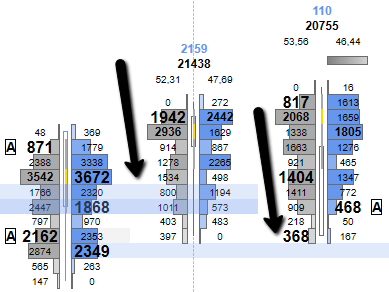 If you are an order flow trader you can't miss this advanced feature. The Dom will help you to see the actual volume traded through the best bid and best ask. You will see the delta of limits and with the iceberg detection column, you will follow where the market is trading hidden volume. A set of tools to let you make the best decisions in your trading. We are constantly adding new features and suggestions based on our self-experience or from our customers. Give us support and, BUY IT NOW! On what platforms does the indicator work? It means that if you purchase the indicator will not have to make any further payment, although we will add new features or updates. Can I use Paypal to purchase the Indicator? No, you can't. We don't use Paypal. You will be able to pay with a credit card only. Can I read the manual prior to purchase? No, the video manual is only for customers. If you have any questions about how it works you can e-mail us. We can arrange a one to one session if you want to see the software running. If the content of the web is not enough to make a decision to purchase it, contact us. We will be glad to assist you in what you need. Can I refund the purchase? It is a number that identifies your computer, based on the motherboard and the processor. When making the purchase, you can download an application to send us that information, and so you can license the indicator. This will only work on that computer exclusively. If you have purchased additional licenses, the same process will be followed. What happens if I change to a new Computer? Do I need to buy a new license? It is not necessary, as long as we can deactivate the one you currently have. For that you must send us an e-mail, explaining that situation and we will send an application for you to deactivate the license on that computer. To know that you have done, when running that application will generate a .txt file that you must send us by email, which will allow us to know that the deactivation has been satisfactory. It is an application similar to the one that you had to download when making the purchase of the indicator so that we activate it. Can I take a trial prior to purchase the Indicator? No, we don't give trials. We sold tools, and if you don't know how to drive don't buy a car. Don't expect magic things in our software. The software will not give you the consistency. Does it Work in the Forex markets? Forex markets don't have centralized volume. 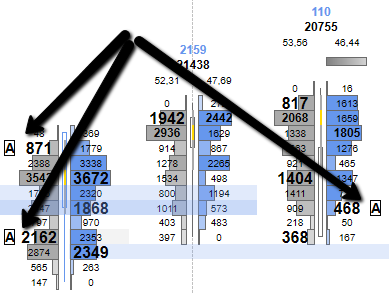 Use this type of tools for Futures markets, where the volume is centralized. All information provided on this website is for educational use only and in no case is an investment counsel, or an invitation to buy or sell a financial instrument. There is a significant risk of loss in the transactions of futures, commodities, stocks, options and foreign exchange products. You should carefully consider your financial situation before trade any financial instrument as there is the real danger of losing all your money. Venture capital is one that is lost does not affect the investor's financial security or lifestyle. You only have to use venture capital to operate and only those with sufficient risk capital should consider trading in the markets. Past performance is not indicative of future results.